Nordia Orillia and their furry friends laced up and walked for a good cause! On Saturday, the Nordia Orillia team participated for a first time in the Friends For Life Walk, a fundraiser for the Ontario SPCA and its Affiliates supporting the protection and care of animals in need. The team finished in the top 5 donors as they raised $365 to the cause. Congratulations and thank you to everyone who made this event a success! On Septembre 30, the Nordia Orillia team participated for a second year to the Ride for Refuge event, which is a family-friendly fundraiser in support of local charities who provide refuge and hope for displaced people. Nearly 30 participants geared up this year to walk or bike, and raised over $800 in support of The Lighthouse Shelter and Couchiching Jubilee House. Congratulations to all the participants and to all the volunteers who contributed in making this a successful day! Nordia Orillia raises over $1,000 during the Big Bike event! 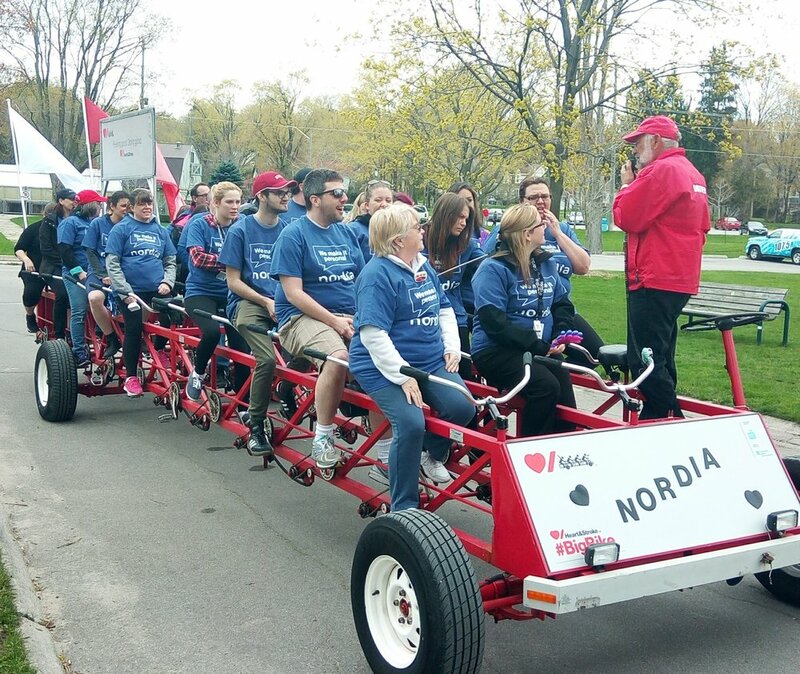 On May 11, for the second year in a row, 27 employees from our Nordia Orillia centre participated in the Heart and Stroke Foundation's Big Bike Event, which was held at Couchiching Park. Not only did they have lots of fun riding Canada's ONLY 30-person bike, but they also raised $1,017 to support heart disease and stroke research and managed to successfully ride through the whole route without losing anyone! Congratulations and thanks to everyone for their participation and generosity!